Berlin - where to begin! When we arrived in Berlin, Erika's friends, Gabi and Gert, were there to meet us at the train station. The station is composed of a glass canopy and is many levels deep with a huge shopping center running through it. From the start you get the feeling that Berlin is big. After we got settled into our hotel, the Metropolitan, the five of us took a walk to the Kurfurstendamm, a broad and elegant boulevard and one of the main arteries running through Berlin. 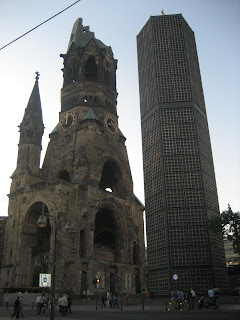 We took a quick peek at the bombed remains of the Kaiser Wilhelm Memorial church and the adjoining new church designed by architect Egon Eiermann. From the outside, the new church looks simple and boxy with a myriad of glass panels. 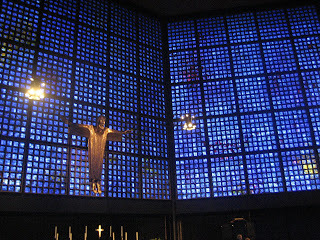 But on the inside, you notice a very impressive array of dark blue glass panels back-lit from the outside sun light. To make it even more interesting, the cross that hangs inside, is from the Coventry Cathedral, an English city that was destroyed by the Germans in WWII. After our quick neighborhood tour, we had dinner at a local restaurant. Gert went on to divulge that he planned a tour for us the following day. Incredibly, he had mapped it out, timed it by driving it and taken pictures of each of the sights we were going to see. Of course, in the plan, he also had worked in appropriate eating and drinking breaks. The tour started promptly at noon. It was a dizzying day as Gert drove us criss-cross from one end of Berlin to the other. At each eating and drinking stop, Gert reviewed what we had seen (photos included) and on a map, showed us where we had been and where we were going. Gert's intent was to give us a glimpse of all the main sights and then in the following days we could go back to visit the specific ones we found most interesting. We saw nearly all the main sights, including the complex that hosted the 1936 Olympics, the Bundes Parliament, the German Chancellor's residence, the Jewish Memorial Park, the Brandenburg Gate, the museum island (Bode Museum and many others), the East Berlin Radio Tower, the Old Synagogue, the Stumble Stones (a memorial to the Jewish families taken from their homes), the Rathause (city hall of Berlin), the Jewish Museum (each Jewish building in the city has two police officers on duty 24x7), Turkish neighborhood and lots more. We also drove along a boulevard in the eastern area showing how they've engineered new facades on the old gloomy Iron Curtain buildings to spruce them up. What a difference it had made! Berlin was a city in the midst of East Germany (DDR). Furthermore, the city was divided into two main sections - the Russian and the Western section. The Western Section was further divided into the American, British and French sector. When we got to Check Point Charlie, that point really became clear with all the historic signage related to the fact that you "leaving the American Sector" when you crossed that line. We drove by what used to be a building that housed the SS and their torture chambers. What was sad to hear was how Gert described it "the building that was a big version of Guantanamo." Gert is a very pro-western, pro-American individual. Hi comment simply reflected the reality of how the world views Guantanamo and what the US has done there. Very unfortunate. 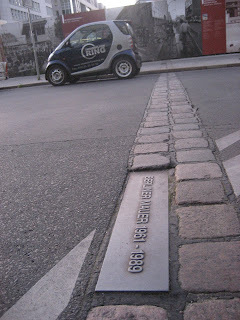 As you walk around Berlin, on some roads you can spot a line of cobble stones. The stones represent where the wall once stood. In some areas they left the wall in tact and have allowed artists to paint murals on it. 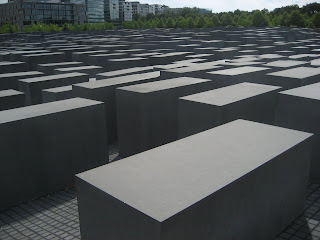 It's a very unique and somewhat haunting sight, knowing how many people died trying to jump the wall to the west. Interestingly enough, at the time the wall was being built, the DDR said it was to keep out the West Germans. How funny! One of the observations I made of Germans is how tolerant and civil they are to each other. For example, in the train we were on there was a woman who sat next to me. Her two small kids were across the aisle. In trying to keep them amused, she was often stooped over in the aile, which also was being blocked by someone's huge suitcase. In the US, the train conductor would have told them all to find their seats, and that for safety reasons the luggage would need to be stowed away. Not here. Everyone, including the conductors would laboreously weave around all the obsticles, not saying a word. Another example was when Gert was chaufering us around Berlin. He often would slow down and sometimes even stop to show us a sight and talk about it. No one ever honked their horn or flipped him off, which for sure would have happened in the US. They just drove around him. On one of the days, we took a walk through one of the neighborhoods that Erika had lived in and ended up in a large nature reserve. We were actually on the lookout for a place to have a drink, when we ran into a small lake and many people sunbathing, mostly all in their birthday suits. It was a sight to see because it was a field of high grasses. It looked more like the African Serengetti with naked human animals instead of lions and tigers lounging around. I resisted taking a photo, respecting people's privacy - but it was hard. The concept of the Wall (Maur in German) is ever present in the minds and hearts of the Germans. People still think in terms of Oesie and Wesie (Eastener and Westener). Billions of Euros have poured into East Berlin and the rest of the east. West Germany had to absorb the huge cost during this time of change. This remains a source of frustration. To make matters worse, there are a number of East Germans who now insist that things were better back in the old Iron Curtain days. Part of that is due to the thousands of jobs that were lost in the reunification. But also I think that some of those who lost their jobs were people who liked the old, less competitive society, one in which you had a job for life no matter how well you performed. Another interesting point was the number of building that were duplicated. When the wall was put up around Berlin, the western part of the city lost several important buildings such as the opera hall, some important museums as well as radio towers and other structures. So the West proceeded to build new ones. Now after reunification, they have two of those structures. Yet with all that, the eastern part of Berlin is today the "happening" place. A lot of the younger people prefer the new stores, restaurants, buildings and night clubs in the east. 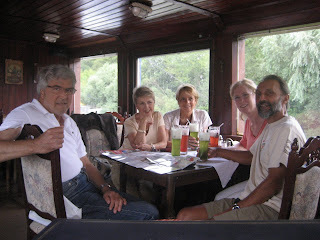 On our last full day in Berlin Gabi drove us to a place where we boarded a boat to Potsdam. It took about an hour, going through narrow channels and lakes. past castles and sailboats. It was a warm day, so it was perfect to be out on the water with a little wind in our face. When we got to Potsdam we found our way to what it's best known for - the Sanssouci Palace. It was the summer residence of Frederick II, the Great. It's an average looking palace, as far as palaces go and that was intentional. Freddy wanted a place to relax without worries - that's why it's called "sans souci". It was a great opportunity to get a tour of Berlin from Berliners. We got great insights into German life as well as life in Berlin. Some of the things that surprised us was how the level of social support systems have decreased in scope and real terms. For example, although everyone has health insurance, the ones who can afford it, buy extra private insurance for a number of things that are not covered. Welfare programs as well as pension systems have been scaled back while some programs have been partly privatized. Seeing beggars on the street is now relatively common. On Monday morning, we finished packing, had breakfast and checked out. Gert was his normal, punctual self and showed up at 9:50am to take us to the train station. It was Amsterdam for Diane and I while Erika was heading home to Bernau.